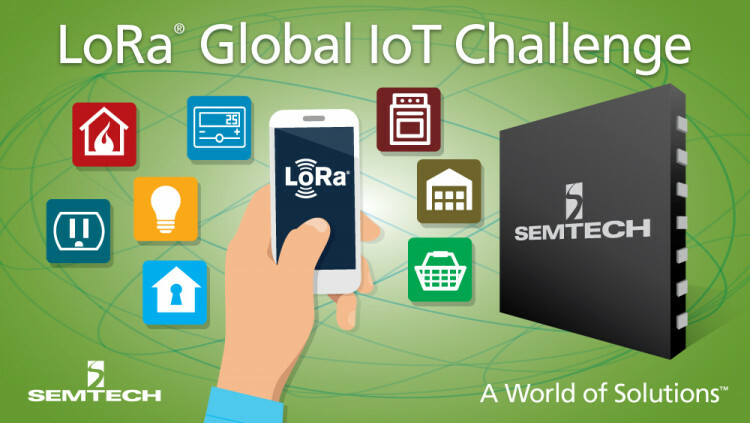 Semtech Corporation (Nasdaq: SMTC), a leading supplier of analog and mixed-signal semiconductors, today announced that its LoRa® wireless RF technology was used by the three finalists of the Global Internet of Things (IoT) Challenge to develop exciting new IoT applications, including a home automation system, a bed bug monitor and a pallet tracker. More than 200 companies from around the world participated in the challenge and solutions were judged by Machina Research and the Board of Directors of the LoRa Alliance on criteria such as degree of innovation, overall business potential and go-to-market approach. The winning solution, Connected Home, was presented by Leroy Merlin, a home improvement and gardening retailer with more than 370 stores in twelve countries. Connected Home is a universal gateway with several protocols that will allow consumers to control a wide range of devices in their home using a single app that they can install on their phone or tablet. LoRa Technology is built into the gateway as a communication link that can deliver important alerts such as fire, gas, flooding, and CO2 messages. With the application, users will be able to control things like lights, heating and air conditioning, drapes, alarm systems, electronic components, appliances, garage doors and more. In addition, the app will allow users to scan groceries to keep an inventory of what they have at home; making it easy for them to know what items they need to buy. Gupsy, one of the finalists that specializes in developing and deploying IoT platforms for industrial customers worldwide, created a LoRaWAN™-based bed bug monitor for motels and hotels. According to Gupsy, manually monitoring bed bugs costs hotel owners $20 to $25 per room weekly, and cleaning an infested room can cost upwards of $650. The system attracts and traps the bed bugs inside a monitor where a camera takes a picture of the bed bugs and sends the information to hotel owners or managers over a LoRaWAN network. The solution automates the current bed bug monitoring process, eliminates the cost of manually monitoring rooms, and improves the alert time to reduce the chances of a costly infestation. PalleTech, another finalist that specializes in helping companies track their cargo, used LoRa-based sensors embedded into shipping pallets to create a solution that allows companies to better monitor their cargo shipments. PalleTech works directly with pallet providers to create smart, connected pallets, which companies can then use to ship their merchandise. The sensors embedded in the pallets allow companies to track their shipments as well as their condition since the sensors can also monitor for variables like heat which can potentially damage sensitive cargo. The information collected from the sensors is relayed wirelessly via LoRa-based gateways to a cloud-based system that operators can access remotely. All finalists won a trip to CES 2016 in Las Vegas where they received their awards and presented their solutions at the LoRa® Alliance reception. The LoRa Alliance is a group of 200+ companies that are dedicated to standardizing the Low Power Wide Area Networks (LPWAN) being deployed around the world to enable IoT, M2M, smart city and industrial applications. Long Range: A single LoRa base station enables deep penetration capability for dense urban environments and indoor coverage, while also providing the ability to connect to sensors more than 15-30 miles away in rural areas. • Low Cost: LoRa reduces both upfront infrastructure investments and operating costs, as well as end-node sensor costs.